Dominate the Craps Table and Have Other Players Cheer Your Name! My name is Dennis. I’m also known as Master Setter in the craps world and amongst my students. After playing craps for 10 years and teaching successful students for about 7 years, I know how to win at craps consistently. I’ve even had investors invite me to shoot craps in their country – all expenses paid. Yep, read that again. The doctor told me I had all kinds of issues with my right arm. Most of them ending in itis’. Playing and practicing the same way each time caused me many problems. I had become so consistent in the way I tossed my dice, that shooting over and over messed up my arm. Hot rolls were impossible. I could only toss the dice about 2 times before I was in searing pain. I was stuck. All the books and seminars that helped me improve my rolls taught methods that hurt me in the first place. What’s worse is they only teach one way of beating craps. I was starting from step 1 again, but this time in a worse place than before. I had the knowledge, but couldn’t do anything about it. Even brand new craps players were in a better position than I was. If I retrained with my left arm, maybe I could win again. Given the fact, I couldn’t even brush my teeth with my left hand – it would be a challenge. On the other hand, I’d likely hurt my left arm as well. After searching like crazy, I couldn’t find any new training that could help me win at craps again. I also hunted for the latest and greatest betting system. I bought plenty of books and videos. I even trained with a guy I saw on a T.V. reality show about Caesars. However, all these ‘systems’ failed when put to the test. I ran their bet strategies through computer simulations. All I did was prove what I already knew – that betting alone could never beat the house. I decided to train my left arm using the ‘perfect’ toss I already knew. I just kept losing and knew something needed to change – quick! I loved craps too much to give it up. I didn’t want to give up the crowds cheering my name. That feeling of nearly removing the 7 from the dice was too great to let go. I felt I was letting down all those grateful players that threw money at me during my hot rolls. They had bought me lunch and trips just because I made them lots of money. And now, I wasn’t able to roll enough to break even. Nothing was working while retraining with my left arm. I knew it would take a long time to get back the skill I needed to win. Way too long. Also, I was now in danger of hurting my left arm. So, I started testing new ways of tossing the dice. I also worked on a highly optimized betting strategy that didn’t resemble anything to date. I invented some crazy looking tosses so I wouldn’t hurt my left arm. A new toss would also need to provide great results. I noticed that one of my tosses kept rolling a particular set of 7’s. To craps players, the number 7 is normally a losing number. Hmm… I tried capitalizing on the 7 by changing my bets. This didn’t really help, but I knew there was something there – I could ‘feel it’ in my bones. I just couldn’t plainly see it. I stumbled upon an easy, consistent and comfortable way of tossing the dice. I just couldn’t let it go – even if it was a 7. Being a computer programmer, I jumped on my PC and feverishly went to work. I had to find the ‘missing piece’. Up to this point, I had bought and downloaded all kinds of software. They just didn’t help. I had to write my own. Eureka! I created a computer program that helped me discover a personalized set with my new and whacky toss. I now had a way of arranging the dice that was unique to me. Along with my new toss, I could roll the money-making numbers over and over. I was now able to throw with my left arm and have great results. They were as good, if not better, than the results I previously had with my right arm. It was a fast and easy toss to learn. I didn’t have to throw the ‘perfect’ toss as traditional Dice Control teaches. I threw my own way, and was able to kill it at the tables again. The best part is I could practice a little or a lot and it never affected my arm again! No pain!!! This new toss was so easy to use; my right arm picked it up right away. I threw even better than ever before! Why is this new method better than anything currently out there? Instead of learning a complicated, potentially painful and time-consuming way to roll the dice perfectly… Imagine using one quick and easy motion to produce predictable results fast. It only takes a few minutes to explain. And, with some of my simple exercises, you can get it right in less than a day. Instead of setting dice slowly and having them taken away, while customers groan impatiently… Imagine setting the dice blindingly fast and ready to toss in just 1 or 2 seconds! Instead of overused, outdated betting systems that always lose over time… Imagine a customized betting system that is tailored-made to your personal situation. Maximize your profits and limit losses on other shooters! Instead of praying someone has a hot roll… Imagine taking a hot shooter to every craps table you visit – yourself! 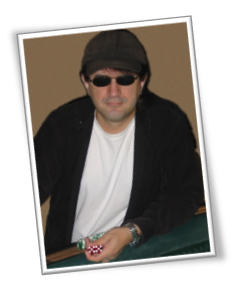 Ninja Craps is a video membership site that offers step-by-step detailed instruction on beating craps like a pro. 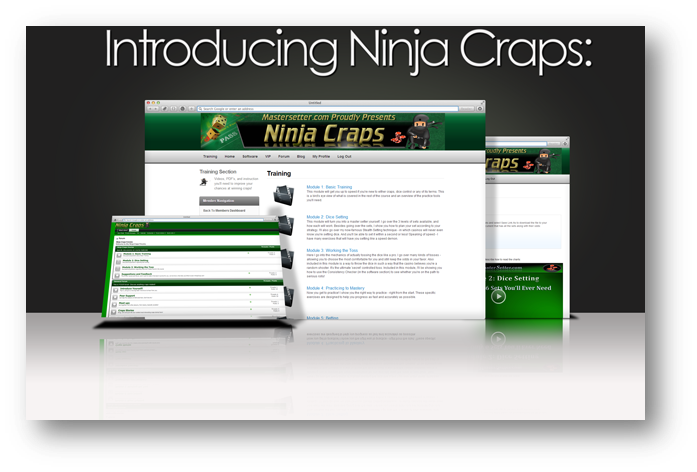 Ninja Craps is loaded with videos, downloadable PDF’s, spreadsheets, online software and more. 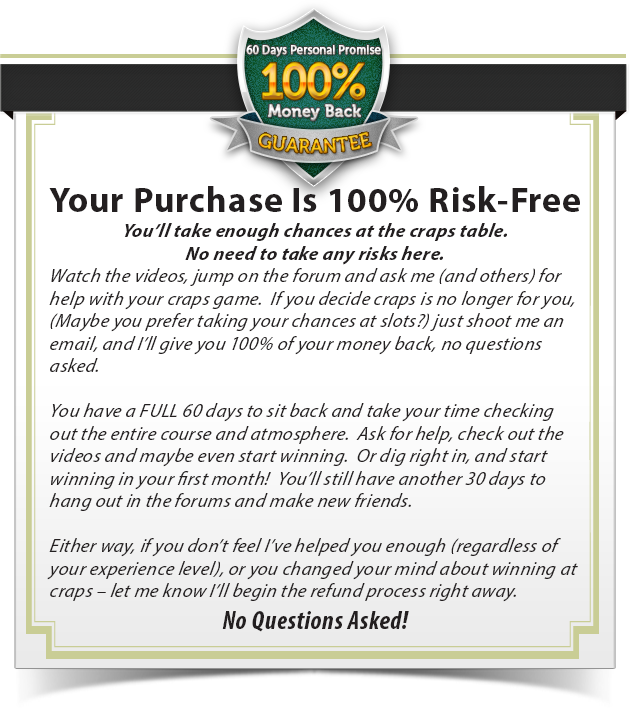 Get all the information you need to beat craps in a crystal clear delivery system. Still have questions? Meet up with other players, or simply make new friends by heading over to our exclusive forum. Here, real players help you better your game in a respectful, helpful and non-judgmental forum. And it doesn’t end there. I’ll be adding cutting edge material to Ninja Craps far into the future. when you become a member? I know… You’re probably thinking this is going to cost a lot. It’s true I charge $100 per hour of my time. 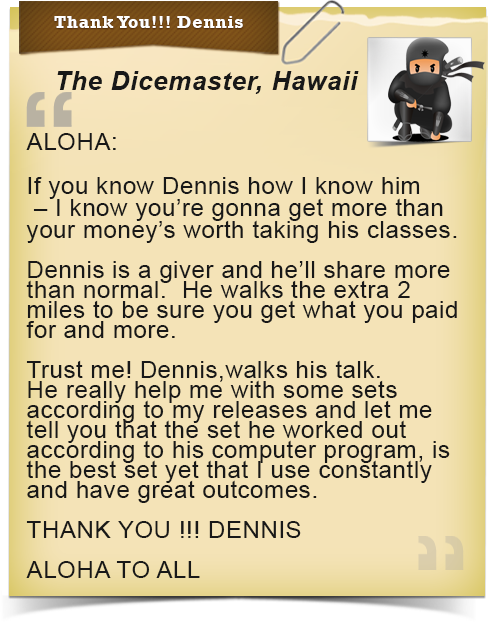 Without this course, students have to book many lessons to learn what’s inside of Ninja Craps (IF I’m available). They usually pay me a minimum total of $1,200. That’s still less expensive than a weekend seminar I (and many others) paid for. Even the outdated DVD’s some companies offer start at about $400! But don’t worry, Ninja Craps doesn’t cost anywhere near what you’re thinking. My customers and students always know I go above and beyond for them. And right now is no different. 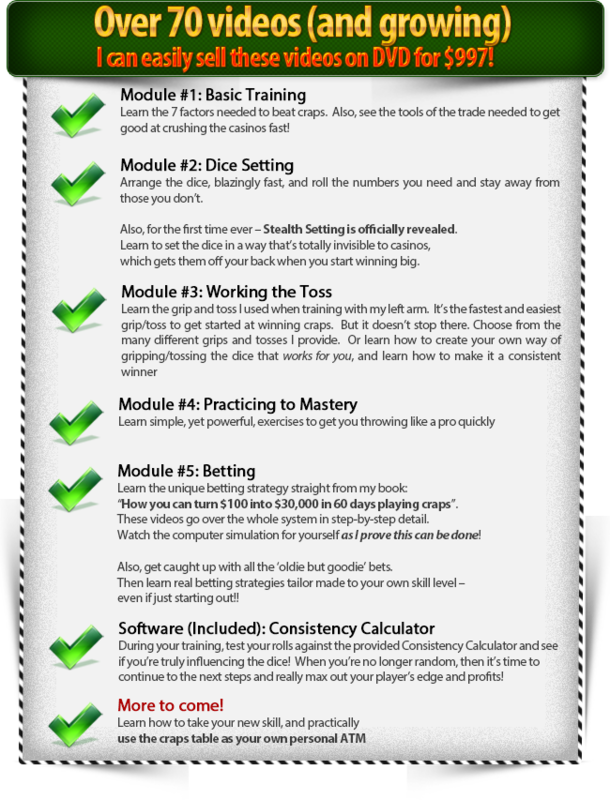 If you’re new to craps and betting, Ninja Craps has fully detailed tutorials to get you up to speed. However, as a bonus, I’ve gathered some great articles from multiple sources and compiled them into one small book called “Fast Craps 101”. It’s a quick read, and it’s a great supplement to get you caught up fast with the world of craps. Download it, print it and take it with you. And whenever you’re ready – dive into Ninja Craps and get ready to rock! This is a limited time bonus, since I intend to sell it for $25 in the near future. But, you get it free for signing up today! 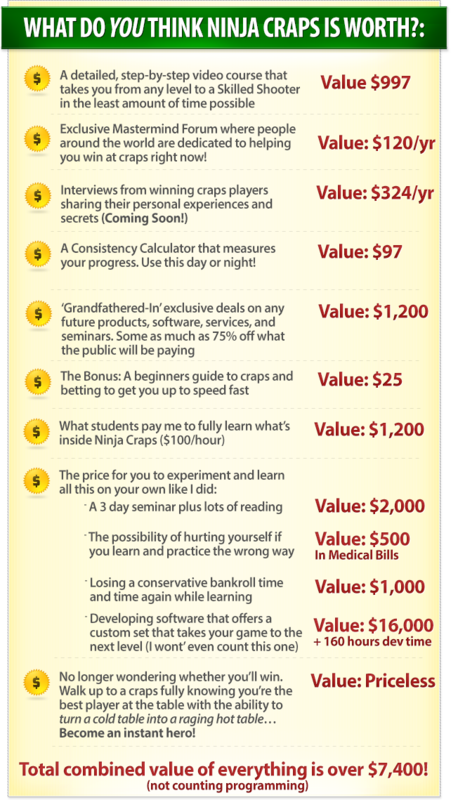 Even if you did spend $7,400+ to become a professional, skilled craps player – you’d have a chance to double that with everything you’ll learn and use in Ninja Craps. 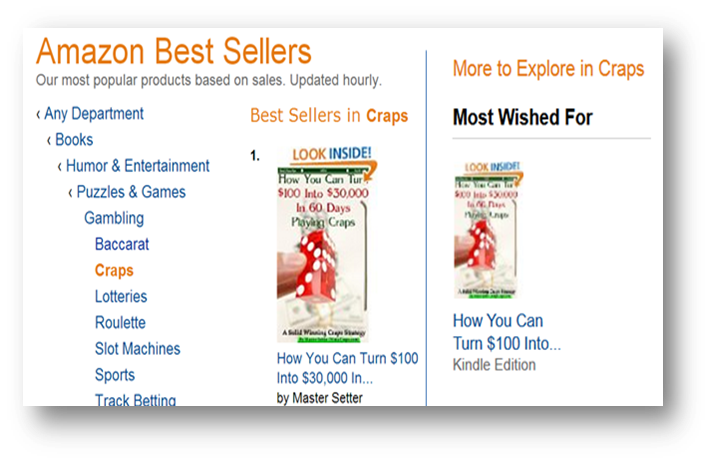 Heck, just putting the contents of my book into the course can help you turn $100 into $30,000 in 60 days! Then, as part of this offer only, you won’t pay anywhere near the $997 I’m planning to charge. So, why is the price so freakishly low? I’ll get into that in a second. First, let me make this extremely easy for you..
You’re in a rare, and unique, position. You’ve hit this page while I’m still in the process of adding videos to the modules. The course is nearly complete and because of this, I’m offering you this course at a steep discount. However, once all the modules are 100% complete and I’m ready for the ‘official grand opening’ – I’ll be charging, at minimum, $797 for entry into Ninja Craps. And, this won’t include the bonus book which I’ll sell for $25. Like I mentioned before – I tried finding a new way of playing craps because of my left arm! It just doesn’t exist. I had to take beating craps to a whole new level. Besides developing new ways of tossing, I created unique strategies to take maximum advantage of anyone’s skill. All the other places I’ve learned from have very generic methods that weren’t very helpful. What I’m offering is something very different from what’s out there, and you have the chance to get ‘grandfathered-in’ at an incredible discount. Very few people know my ‘secrets’. 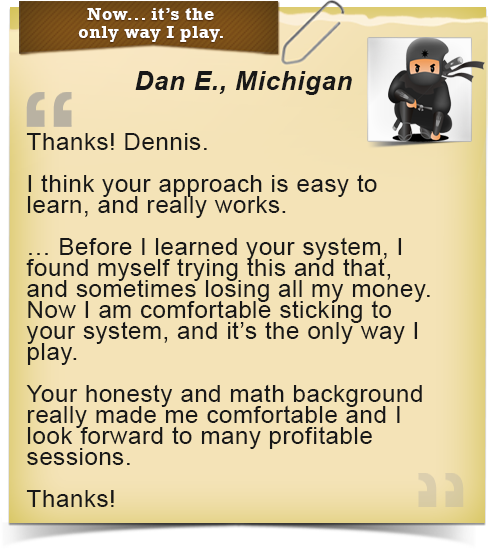 Only my students/customers (whose reviews you’ve seen here) and a handful of friends know what I teach inside Ninja Craps. Now you get the chance to join this elite circle of players and be ‘in the know’. So before the price jumps to $797 (or more), take advantage of this early bird offer! Umm, so… What are you waiting for? You want to beat craps. I know how to increase your chances and get you there quickly. I’m making it super easy for you to get the help you’ve been looking for at a ridiculously low price. Trust your gut. You’ve heard what others have to say about Ninja Craps and myself. I’ve laid it all on the table, and now it’s up to you. How can I say that? 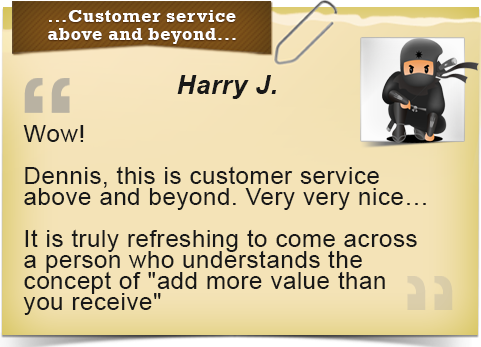 Mainly, because of all the thank you emails I get from students and customers, tells me I must be doing something right. Click the ‘Add to Cart’ button below and get started right now! I just want to say thanks for reading this. I’m looking forward to returning the favor, and helping you beat craps. Let’s work together and get you winning! I’m determined to help my students and customers better their game. (Yep, I’m a real person). 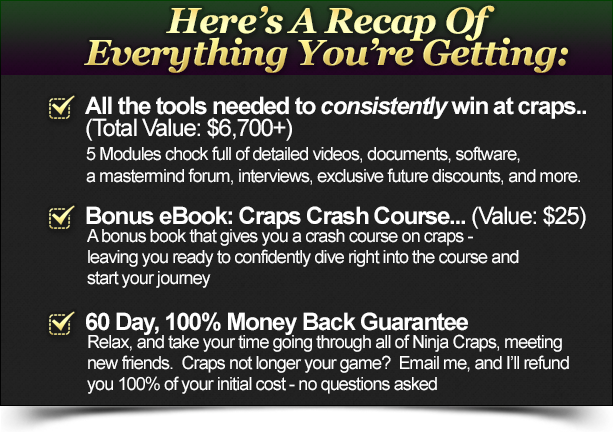 Once you learn what’s inside Ninja Craps, you won’t want to play any other way – because it simply works! P.S. – You’re still here? You’re obviously interested. You obviously don’t want to continue losing at Craps. In just a few moments from now, you can be on the road to beating Craps once and for all. You owe it to yourself to give it a shot — especially since, you have absolutely nothing to lose because of my no-questions-asked 60-day money back guarantee. Keep in mind this low price of $497 is only temporary and will be shooting up to at least $797. We all love a ‘grandfathered’ deal – so jump in while you can by clicking here!